Choosing office equipment for your company can be a daunting task. Many companies wonder whether leasing or buying equipment makes the most sense for them. One rule of thumb that works well for many companies is: If it touches the floor, lease it. If it sits on a table or desk, buy it. There’s nothing wrong with buying your company’s desktop printers, as these tend to be fairly inexpensive and low maintenance. However, for today’s large, high-tech, multifunction printers and print production equipment, leasing is the way to go. Leasing larger scale office equipment is the best way to keep things up to date. 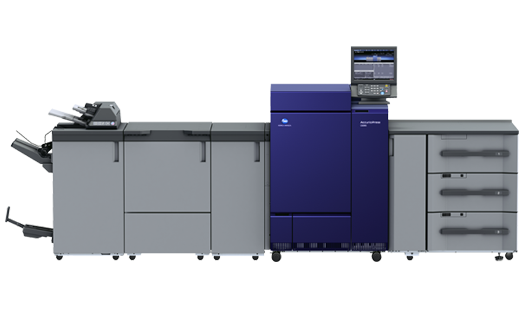 Commonwealth Digital Office Solutions offers the very best multifunction devices from Konica-Minolta. These top-of-the-line, high tech machines do it all: printing, copying, scanning, fax and email. With these cutting edge devices, it’s important to stay on top of the latest technology. Leasing equipment from a trusted supplier like Commonwealth allows you to stay up to date rather than getting stuck with an expensive dinosaur. Leasing office equipment makes it easier for businesses large and small to get the equipment they need with minimal upfront costs. Leased equipment means a predictable monthly fee that is easy to fit into a company’s budget. Many of our clients are small businesses who want and need the latest printing/scanning/copying technology, but who don’t have the budget for large up-front expenditures. A non-profit or educational institution that relies heavily on in-house printing is a great example of a company that is well served by an equipment lease program. This client may need print production equipment to handle high volume printing but finds that it would be cost prohibitive to purchase the equipment. A lease program makes it easier for a small business, school or non-profit to get the best technology for a reasonable monthly fee. One of the most important reasons clients opt to lease office equipment is maintenance. With a lease from Commonwealth Digital Solutions, maintenance is covered, taking a big concern off our clients’ plates. Commonwealth’s We Care program is one of our claims to fame—and one of the highlights of our customer service program. Through the wonders of technology, equipment leased from Commonwealth automatically lets us know when supplies are low—or when there’s a problem—so that we can send toner and other supplies before you run out. We are also on top of any issues that may arise before you—avoiding the need for service calls. The We Care program essentially offers our clients 24/7 maintenance team with a four-hour response time guarantee. We also offer our clients the convenience of a single invoice from one supplier for the lease and any supplies or service needs. At Commonwealth, leased equipment and customer service go hand in hand. With so many providers offering equipment that completes the same processes, a company’s commitment to customer service becomes as important as the products it sells. We stand behind the high quality of our Konica-Minolta products, but we know that our top-notch customer service program makes us stand out above the competition. A lease with Commonwealth brings with it an experienced customer service team that will stay on top of maintenance and supply issues—in many cases before our clients are aware there’s a problem or need. We offer customers a one-year, money-back satisfaction guaranteed return program. But as you can imagine, we don’t have many takers. As most business owners and managers know, office technology is moving at an incredibly fast pace. Keeping up with changes can be difficult, but a lease program with a top-notch supplier is a terrific solution. An equipment lease with Commonwealth Digital Office Solutions brings a built in maintenance, employee training and customer service team and takes the worry out of selecting and maintaining high value office equipment.